The compact design and multiple signal inputs make the DI15 suitable for many industrial applications.This universal digital indicator easily adapts to specific measurement tasks and installation requirements without additional tools. Signal input selection is accomplished by using specific terminals on the back of the display and selecting the signal input type in the menu. 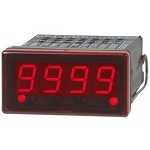 The display can be programmed in any engineering units and the switch settings are programmable using the push buttons under the front bezel. A user-friendly, structured menu guides the operator through all the necessary program steps by displaying text in the LED display. Two user programmable transistor switching outputs with independently adjustable hysteresis are standard. The digital processing ensures that the alarm set points are switched accurately. The response time can be set from 0 to 99 minutes. An EASYBUS serial interface for measuring data transfer is a standard feature of the DI-15.Stainless steel retaining clips are provided for easy installation in panels up to 0.39" (10 mm) thick. The compact design is suitable for installations in locations with limited mounting space such as vehicle dashboards.